The first Mothers album I bought was "Weasels Ripped My Flesh!". The first track on Side 2, iirc, was titled "Eric Dolphy Memorial Barbeque". At the time, I figured it was Zappa's idea of a goofy name, nothing more. A couple years later, I learned otherwise. In my mental listing of most tragic early deaths in jazz, Dolphy ranks at the top. He wasn't that young (36) when he died, but you get the impression he was poised for incredible things as regards merging several traditions into a new form (jazz, eastern, contemporary classical). Could've ended up in a proto-New Age hodgepodge, who knows? But I'd love to have heard it. 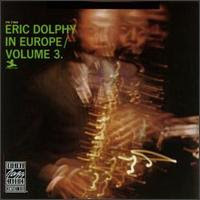 Plus, he's the subject of probably my favorite punning sobriquet in jazz: The Ericle of Dolphy. 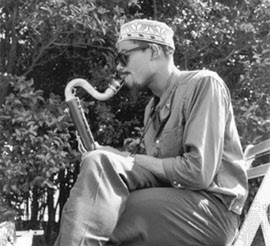 He's also somewhat unique in having been an integral part of ensembles led by three major forces: Coltrane, Coleman and Mingus. I've asked before if there's anyone else who recorded with all three (leaving aside prominence in the ensemble) and the only other one I'm aware of is Elvin Jones (minimally with Mingus and Ornette). Always a little surprised he never, to the best of my knowledge, played with Cecil. 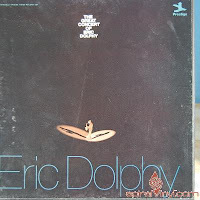 As with many other "earlier" musicians whose music was often played on KCR, I was laggard in buying albums under Dolphy's name until well into the CD era, owning but two. (Wonder how many "Great Concerts" Prestige issued over the years...?) 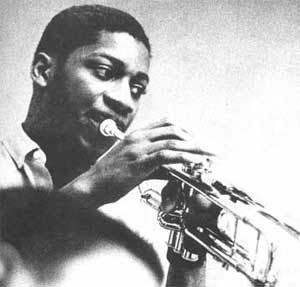 3-records, no liner notes, a date from 1961 with a sterling quintet: Booker Little (another likely in my Top 10, Died Too Young) on trumpet, the still-undersung Mal Waldron on piano, Richard Davis/bass, Ed Blackwell/drums. All longish pieces, some pretty great, especially the closing "Booker's Waltz". Dolphy close to that cusp, occasionally exploding all over the place within a fairly trad structure. Weird recording, third of three volumes with a Danish pick-up band from 1961. Still fascinating to hear Dolphy at the time, including working through three takes of "In the Blues". By '72 or '73, I'd read of Van Vliet's admiration for him, though he famously said that, as much as he loved Dolphy, he'd rather hear a goose. the fact that he died when he did is tragic but how he died is even more so. collapsing in europe from a case of undiagnosed diabetes and the doctors assuming he was another junkie jazz musician they just let him be/die. as to the question of choosing dolphy or a goose...ill take both simultaneously. I do that train ride ALL THE TIME, and I also find it incredibly pleasant (for pretty much all the reasons you articulate). I've got a round trip train to Minneapolis coming this winter.....we'll see how that goes!